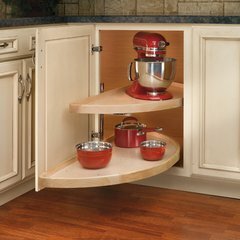 This beautiful blind corner cabinet solution is made from 5/8" thick multi-ply wood with a 1" high solid wood rim. Features include pivot and pull slides that can be adapted to a right or left hand application. Minimum Cabinet Opening Depth : 22"
Minimum Cabinet Opening Width : 12"
It has not been installed yet. The theory appears great. It takes dead corner space and puts it to use.